I’m sitting at my desk this morning as I write this, with the door open behind me. The morning sun feels warm on my back and towel-dried hair, noisy Canada Geese just flew by, and I keep getting wiffs of the burn pile that’s still smoldering down in the orchard. Its definitely fall around here. These sights and sounds around me tell me it’s true. 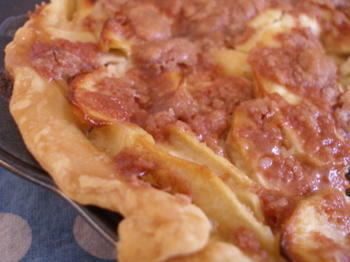 Last night I made Sour Cream Apple Pie, a recipe that alicia posted about a few weeks ago. It was so yummy and so incredibly easy. Good warm with a little drop of ice cream. And I’ve been neglecting my sewing machine lately for my knitting needles. I’ve put down the one-button swingcoat and picked up a pattern for a baby sweater from this book by Erika Knight. I don’t know why I haven’t just broken down and purchased this book. I love almost every pattern in it. And I think I’m the only person that ever checks it out of the library….although I probably don’t give other patrons the chance, really. I’m making a raglan sweater with three little buttons across the shoulder. The pattern calls for embroidery designs all over the sweater when you’re finished….but I’ll probably wait to see what is growing inside me and then decide how I’ll finish it. I’m just really drawn to my knitting lately. It is so easy to pick up, I can take it anywhere and I find it extrememly relaxing. Not to mention it doesn’t require cutting and pinning and measuring, and clearing off my desk to make a space for the sewing machine…. And with all this knitting going on, Emma has been begging that I teach her. I’ve really been avoiding it, because I’m pretty sure she’ll just get frustrated. I’ve been giving her excuses like, "I have to find my big needles" or "I have to get some good yarn for you to start with". 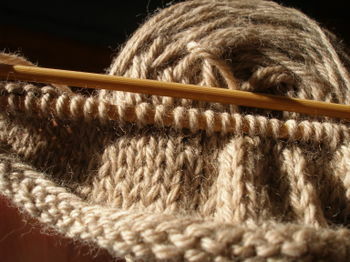 But a few days ago she cornered me with yarn and chubby needles, so the lessons began. She can talk her way through all the steps, its just making her fingers do what her mind understands that is hard. It ends up being a bit of tag-team knitting, really. I must pull away from this post now. I should have answered the well-known call of the chair being dragged across the kitchen floor, because my youngest just appeared around the corner –naked, with a face full of peanut butter. At least it wasn’t nutella…. What a yummy looking pie! My husband is the pie maker in our family, so I will have to show him the recipe. I will be interested to see how Emma does with her knitting. My bean (also 4) has been dying to try, but I also feel she will be frustrated and get easily discouraged. Good luck Emma! Alicia’s pie is my new favorite recipe. It IS so easy! And tasty. Yours looks just beautiful! oh the chair, i alway cringe when i hear the chair being dragged, pretty much never good! i have been itching to knit too! 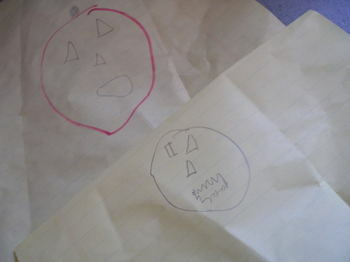 and eliot has been bugging about the pumpkins. time to get busy this weekend i guess! hope there is no peanut butter in the hair, that always bites. Polka dot pumpkins – That sounds really cute! And You got to love those little ones, so in the moment they are. e wants me to trade in my dremel drill for more conventional methods too. have a lovely weekend! Must try that pie – what with all the endorsements everywhere. I also love Erika Knight for baby stuff, so sweet. You have a gorgeous blog! I just discovered it after following a link from Posie Gets Cozy. oh I love that about the chair being dragged across the kitchen floor, all too familiar, and the excuses about the knitting, how old is your daughter, cant seem to get mine, 5 to focus for very long. isn’t that the very best pie EVER?? 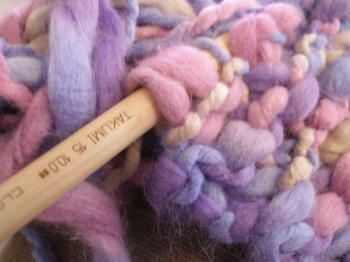 love that chunky lavender-y yarn.